dpmubago, autor en Sevilla. Guía de viajes y turismo. Seville Highlights Motorbike Tour. Discover Seville’s main monuments and landmarks as you ride a motorcycle in a 1-hour tour. 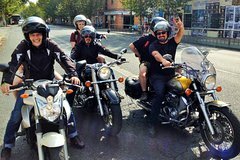 Your professional and experienced motorcyclist guide will drive you around the city and make the most of your visit. Recorrido en kayak en Sevilla. En esta divertida excursión en kayak de 2 horas, refrésquese del sol y vea la ciudad desde una perspectiva diferente desde el río Guadalquivir. 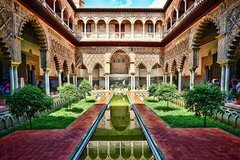 Pase por los principales monumentos y puentes impresionantes mientras el guía le explica los aspectos de la cultura y la historia de Sevilla. 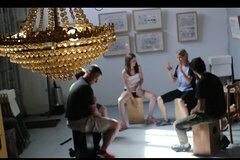 Flamenco Drum Box Workshop in Seville. Learn the art of flamenco percussion in a fun and interactive 1-hour small-group workshop. Surprise yourself and test your rhythmic abilities as you learn to clap your hands and play the traditional box drum. 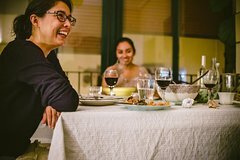 At the end of the tour, savour a tapa and a drink at a carefully selected bar with the guide and relax. Learn Spanish Seville Santa Cruz Walking Tour. 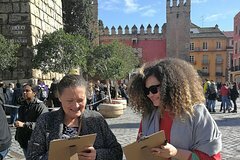 Enjoy a unique experience exploring Seville’s most famous historical neighbourhood, whilst learning some Spanish! Walk through the streets of this beautiful ancient city centre whilst fully immersing in its culture by learning the language. Seville Cathedral and La Giralda Skip-the-Line Ticket. 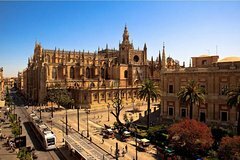 Skip the long lines to one of Seville’s most popular monuments with a fast track entry ticket to the impressive cathedral and bell tower of La Giralda. Get breathtaking views from the top of the tower. The Cathedral can be visited only at the time that your ticket is purchased for which is subject to the availability of the monument. Usually it’s at 11.15am. Sundays after 2.30pm. If you need another time please contact us! Standup Paddle River Tour from Seville. What if sightseeing was different? Come paddle surf with us and explore the city from a different point of view. Cruise down Guadalquivir and navigate your way to the most iconic neighborhoods of the city, discover the river’s secrets and hone your paddling skills while visiting Seville’s ‘’hidden gems’’. Ferry tickets from Tarifa Spain to Tangier port in Morocco. Travel from Spain to Morocco on a comfortable one hour ferry ride. Cross a continent and the famous Straight of Gibraltar on only one day and immerse yourself in the exotic old town of Tangier before heading back to Europe.